These Russian leaders manipulated the political machines of Russia to control the Kremlin. 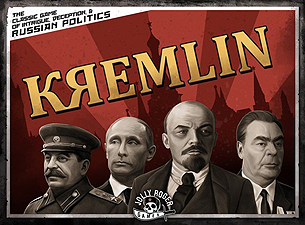 In the game Kremlin, players take the part of political factions out to seize sovereignty of Russia through the Communist Party's offices whether by bureaucratic intrigue or assassination! Are you up to the challenge, Conrade Tovarich? Originally published in1986 by Fata Morgana Games, Kremlin is a gaming satire of Soviet culture and politics. Using fictional politicians. The Jolly Roger Games version updated the 1986 classic by including rules and politicians for the original Communist leaders of the 1920s as well a modern politicians covering the fall of the Soviet Union and the hiders Russiabn state.